In the language of the area's original inhabitants, Mount Monadnock, in the southwest corner of New Hampshire, is "the mountain that stands alone." This anthology, with its rich mix of original essays, historical texts, and excerpts from oral histories, celebrates the natural and human history of this region. Editor Howard Mansfield says that "the elusive feel of one place exists in that intersection of political and family history, landscape, destiny, expectations, weather and time." 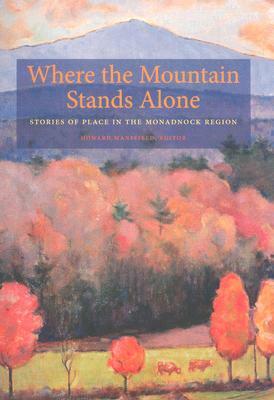 Featuring contributions from such writers as Sy Montgomery, Ernest Hebert, Janisse Ray, Tom Wessels, Richard Ober, Jim Collins, and Jane Brox, Where the Mountain Stands Alone ranges from the formation of the region's distinctive landscape to the lives and customs of its first inhabitants, from the industrialization of the antebellum period to the collapse of both farms and mills, from the region's influence on writers and artists to the rewilding and repopulating of the twentieth century. It is a selective but richly suggestive overview of centuries of human interaction with a particular landscape. "That New Hampshire bluff," as Henry David Thoreau said of Monadnock, "will longest haunt our dreams." The Monadnock Institute of Nature, Place and Culture at Franklin Pierce College in Rindge, New Hampshire, promotes the interdisciplinary study of place and of the connections between community and environment. HOWARD MANSFIELD is author of The Bones of the Earth (2004), The Same Ax, Twice (UPNE, 2000), and In The Memory House (1993). He lives in Hancock, New Hampshire.